In the laboratory, a balance is one of the most valuable and often expensive pieces of equipment. Proper care and maintenance can keep your balance operating smoothly and efficiently, and increase the lifespan of the device. Follow these easy and important steps to help you get the most of your investment. The manufacturer’s instruction manual is your first and best source, especially for general questions about balance maintenance. All new balances come with instructions, and the manual is a great place to find out which maintenance tasks the manufacturer suggests. And if you’re having a specific issue, check for a troubleshooting section in the manual and follow the applicable steps carefully. Your balance will deliver better results with more precision if you follow the manufacturer’s maintenance instructions. Click here to read more about laboratory maintenance. 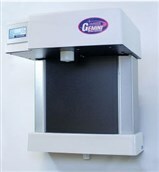 The GEMINI Ultra High Purity Water System provides up to 3.7 liters per minute of 18.2 megohm, 0.2 micron filtered water. The Multi-Pass Ultraviolet system irradiates the water at three separate passes in the recirculation loop. The dispensing port is continuously exposed to UV for complete sterility at the outlet. Water quality meets or exceeds ASTM, CAP and NCCLS Type 1 specifications. Read more about the Gemini-MB on the Aries Filterworks website. The Discovery DSC represents the latest innovation from TA Instruments in the field of Differential Scanning Calorimetry and redefines the standard in performance, quality, and usability. The Discovery DSC features our innovative new Diffusion-Bonded Sensor technology which provides unmatched measurements sensitivity, resolution, and precision. Our field-proven 50-position Autosampler technology has been updated to provide the industry's most reliable platform for true walk-away automation. Visit the TA Instruments' website the learn more about the Discovery DSC. My J6-MI goes to maximum 180RPM stays there for a while and then stops with speed error. Any suggestions. I have a service manual but without electrical schematics. Does any one have electrical schematics? Any help would be appreciated. Advise this member. How do you calibrate a blank tube, just purchased a TriStar II 3020, followed the blank analysis in manual, but can not get results similar to my old TriStar 3000.Was simple with to determine volume below the line on the old tubes, new tubes have no line. Advise this member. Any suggestions on how to remove a stuck rotor from an Eppendorf 5804 centrifuge? I've removed the nut that secures the F-34-6-38 rotor to the spindle, but we cannot pull the rotor off. I've considered filling the rotor with ice or dry ice to see if thermal contraction might loosen it, but have not tried this yet. Advise this member. Union Process, Inc., known globally as a manufacturer of particle size reduction and dispersion equipment as well as related services for a broad range of research and industrial applications, has manufactured a combination laboratory mill that offers the versatility of two mills in a single footprint. Read more. OHAUS weighing technology and products are used daily by professionals to achieve their essential organization goals at the highest level. The New OHAUS Explorer Semi-Micro balances and the Defender 7000 Series scales provide enhanced performance and versatile operation for advanced laboratory and industrial weighing applications. Read more. The Spiral Plug concentration technology works by using vacuum to draw air /nitrogen through a spiral slit generating a vortex which both stirs the sample and creates an increased evaporative surface area. This unique technology allows you to evaporate without worry of solvent bumping and the need to constantly monitor the equipment. Read more. Fungilab’s main focus since its establishment has been to research, develop and manufacture the most advanced viscometers in order to offer their clients the highest and most accurate performance in the viscosity measurement. Fungilab has been distinguished by continuous eagerness for commitment and evolution on their products and services. Their vision is to provide the best quality and high-end performance from each of our products for quality control and laboratory research. Their mission is to connect their customers to the future, today. Visit the Fungilab website to see their full product line. I am looking for an application software copy of ACL top 500. The computer hard drive failed and I don't have a backup CD. Advise this member. Everything on the navigation screen shows green, but "not ready" message is seen. What shall I do? Advise this member. Can anyone tell me the dimensions of a Corning pH Meter Model 440? Advise this member.